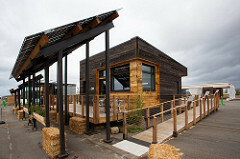 Middlebury College’s InSite House placed eighth overall at the U.S. Department of Energy Solar Decathlon 2013. The team earned third place in the Communications and Affordability contests. After the competition, InSite was returned to the Middlebury College campus, where it has been serving as student housing. Each year, two to three college students can apply to live in one of Middlebury’s two Solar Decathlon houses: InSite and Self-Reliance (2011). These students also are charged with creating an outreach program and occasionally provide tours to students, peers, and community members.